Have you recently added to your boat’s electronics inventory or have you installed a mega-watt stereo system and lights on your boat? Have you added to your vessel’s battery bank and now finding that your batteries are not getting charged fully, or that they take an extremely long time to achieve a full charge? If so, consider the best approach to upgrading your electrical system-increase your electrical production! The alternators supplied with most small marine engines – whether gas or diesel – are usually 35 to 60 amp automotive alternators. Late model marine engines could have 70 to 80 amp automotive alternators. A heavy duty marine high output alternator produces more power at lower rpm, instead of high output at high rpm- freeway speeds for an automobile. BALMAR produces a series of high output marine alternators. The most popular for small marine gas and diesel engines is the BALMAR 6-series alternator, which is available in outputs of 70, 100, 120 and 150 amps. If your engine is equipped with a single 3/8″ wide alternator belt you will be restricted to a maximum of 70 amps. A 1/2” belt will work for up to a 100 amp alternator. If your engine is equipped with dual v-belts or a single flat belt, you could use the 120 or 150 amp 6-series alternator. Even if your marine engine is equipped with a 55 amp alternator, which is a commonly used size, the 70 amp version of the 6-series will produce far more power even though it is rated at only slightly more than your current alternator because it is producing higher output at lower engine revolutions. The 6-series alternator is available in a variety of mounting styles to fit most marine gas or two to four cylinder marine diesel engines. The BALMAR 6-series alternators have a long history of providing reliable power and are found on sailing and power vessels around the world. 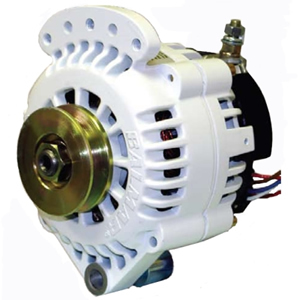 The compact size of this alternator often is smaller than the lower output alternator it replaces. This alternator has a built-in voltage regulator, but if your boat has multiple batteries or battery banks, a BALMAR external voltage regulator must be used for maximum charging efficiency. This also gives the benefit of redundancy, if one regulator fails, a flip of a switch can enable the other regulator. BALMAR produces marine high output alternators from 60 to 310 amp outputs. The lighter duty 6 and 7 series are built for marine diesels such as Yanmar 2, 3 and 4 cylinder engines and gasoline marine engines. The heavy duty 94 and 95 series alternators are for engines such as the popular Cummins 6BT5.9L. The extreme duty 97 and 98 series, with output up to 310 amps, are for very high output marine applications. There are BALMAR alternator and regulator kits available, with different kits suitable for a variety of engine makes and models. The kits are available with either BALMAR’s top of the line Max Charge MC-614, or the BALMAR high performance ARS-5 regulator. The kits also include temperature sensors for both the alternator and battery, which help the regulator determine the appropriate steps in the charge cycle, and assures that the batteries are charged quickly and safely. The BALMAR 6-series alternator and a BALMAR external regulator is the best, easy to install addition to maximize your vessel’s electrical power needs.